If you have any questions about the FILS DE GRACE information page below please contact us. Being built by the Smit J & K shipyard in the Netherlands the FILS DE GRACE is 55 metre 180 (ft) in length. Superyacht FILS DE GRACE can accommodate up to 12 people with 14 crew. The old, former or build project names are Directeur Generaal Bast; Vso Surveyor I; Stm Vega; Sir Arthur J. She can reach a high speed of 11 knots. FILS DE GRACE was originally built as a cable laying vessel by E.J. Smit in 1968. The motor yacht has an overall length of 54 meter with 9.40 beam and 3.20 draft. Rebuilt by E.J. Smit & Zoon’s Scheepswerven N.V., it has a steel hull and superstructure and comes with a Germanischer Lloyd AG class. Smit was the naval architect firm involved in the formal nautical composition for FILS DE GRACE. Also the company Smit and De Haas & Hoogendoorn (Refit) skillfully collaborated on this project. In 1968 she was formally launched with accolade in Kinderdijk and post sea trials and detailing was thereafter handed over to the new owner. Smit J & K completed their new build motor yacht in the Netherlands. The main hull was crafted from steel. The motor yacht main superstructure is made mostly with steel. With a width of 9.4 metres / 30.8 feet FILS DE GRACE has fairly large interior. A deep draught of 3.2m (10.5ft) affects the amount of certain marinas she can enter into, contingent on their specific depth. She had refit improvement and modification carried out in 2009. The 5NL engine installed in the motor yacht is produced by BOLNES. Connected to her Bolnes engine(s) are twin screw propellers. The main engine of the ship produces 350 horse power (or 258 kilowatts). She is equiped with 2 engines. The combined output for the boat is thus 700 HP / 515 KW. Bestowing space for a limit of 12 yacht guests sleeping aboard, the FILS DE GRACE accommodates everyone in style. This ship utilises approx 14 proficient yacht crew to maintain and sail. 54.75 metres / 179.6 feet. The propulsion comes from two 350 HP or 258 kW Bolnes. The Model type is 5NL diesel. Total engine power output 700 HP /515 KW. 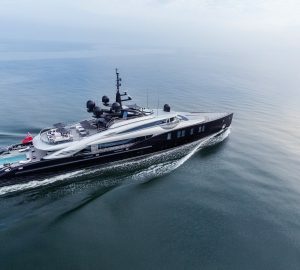 The luxury yacht FILS DE GRACE displayed on this page is merely informational and she is not necessarily available for yacht charter or for sale, nor is she represented or marketed in anyway by CharterWorld. This web page and the superyacht information contained herein is not contractual. All yacht specifications and informations are displayed in good faith but CharterWorld does not warrant or assume any legal liability or responsibility for the current accuracy, completeness, validity, or usefulness of any superyacht information and/or images displayed. All boat information is subject to change without prior notice and may not be current.